With a vibrant 2-2 draw between FC Barcelona and Valencia, the Catalan club wasn’t able to get the three points despite Messi’s efforts. Watching FC Barcelona not win a match at this point of the season is odd, not even Lionel Messi’s efforts could prevent the Catalan club to get a draw against Valencia at Camp Nou. From the very start of the match, there were already some modifications that manager Ernesto Valverde decided to make in the line-up. 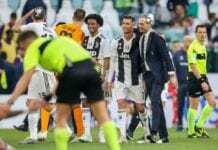 For starters, the manager was forced to do a revolution in the line-up due to Ousmane Dembele’s ankle injury as the Frenchman is still recovering from that incident. The boss lined-up academy product Carles Aleña and Arturo Vidal next to Ivan Rakitic, Busquets didn’t play because he was suspended and this made Valverde get more creative. 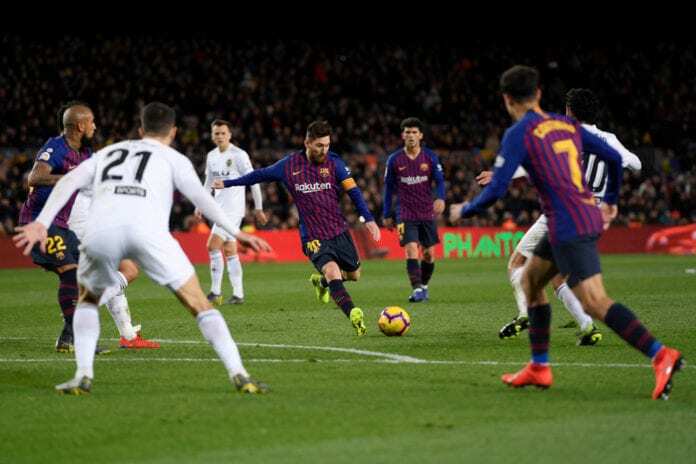 The initial bet appeared to pay off but Valencia also came to Camp Nou to play, they were actually the ones who scored the first goal in a first half that was plagued by accidents of several natures. Rodrigo assisted Kevin Gameiro during a counter-attack that had its origin after a foul wasn’t called on Leo Messi on the other side of the pitch, the Che club took advantage of this and gave Valencia the initial advantage. Shortly after that, Sergi Roberto committed a penalty that cost Barcelona the second goal. Dani Parejo didn’t miss his shot from the spot despite Marc-Andre ter Stegen’s efforts, this two-goal disadvantage was very problematic for Barcelona until the moment when Gerard Pique and Kevin Gameiro collided in the air with their heads. The Catalan defender got a deep cut that the medical staff needed to stitch later, Gameiro wasn’t so lucky. Right after the collision, there was an evident proof that Kevin Gameiro suffered trauma to the head as a bump on his forehead appeared. The French forward attempted to keep playing but he was too dizzy to continue and he had to leave the pitch, Barcelona reacted during this period and they scored their first goal just a minute before the emergency substitution. Semedo got taken down inside the box and Leo Messi was the one who scored the goal for the Catalan club, the Argentine took his shot from the spot with calmness and gave his squad a better chance to turn the game around during the second half. 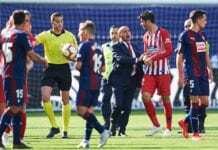 Ernesto Valverde’s initial tactics didn’t pay off as he expected, which is why modifications during the second half were expected from the manager. The first substitution came from the very start of the second half, Jordi Alba replaced Nelson Semedo. The Catalan club then proceeded to create several chances that Valencia actually defended quite well, they knew that they weren’t going to have the initiative and decided to “park the bus” for the majority of the second half. These types of defensive proposals from the opposition tend to be frustrating for a club like Barcelona, especially for Leo Messi because he doesn’t get the spaces he usually requires to manoeuvre at will. The Argentine still fought to at least get that equalizer and he eventually did it with a long-range shot from outside of the box, Arturo Vidal was the one who assisted Messi on that specific moment. 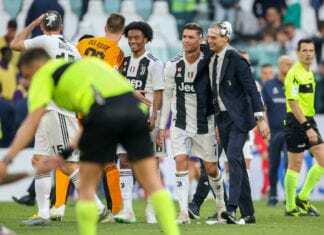 The Argentine scared everyone because of a muscular pain he suffered during the second half, this prevented him from playing at the top of his abilities. He finished the match with this pain that the club later confirmed is nothing too serious, reports from Diario Sport suggest that he won’t miss El Clasico and there won’t be any need to run tests because he only suffered a minor issue on his right thigh. Barcelona wasn’t able to win this game, which leaves La Liga’s possibilities open tomorrow for Atletico Madrid. Why do you think FC Barcelona wasn’t able to deliver this evening against Valencia at Camp Nou? Please share your opinion in the comment section down below.